Sandy Binner will answer the phone any time of day or night a client calls. It’s a commitment she makes because she believes each client deserves superior customer service. 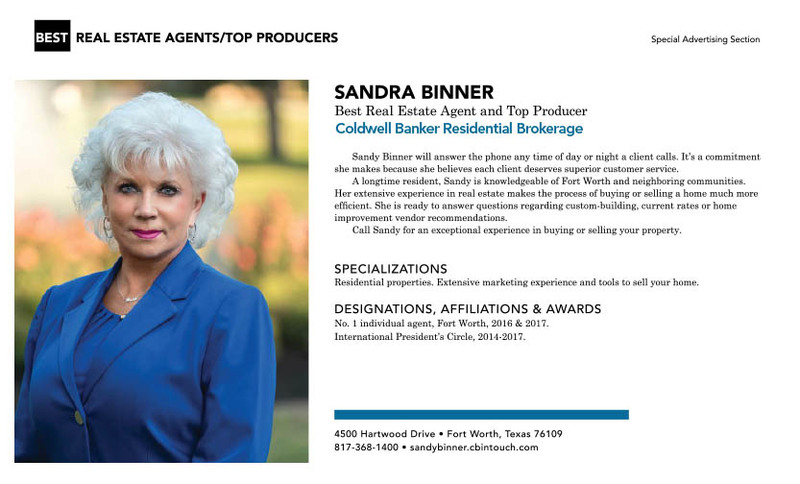 A longtime resident, Sandy is knowledgeable of Fort Worth and neighboring communities. Her extensive experience in real estate makes the process of buying or selling a home much more efficient. She is ready to answer questions regarding custom-building, current rates or home improvement vendor recommendations. Call Sandy for an exceptional experience in buying or selling your property. Residential properties. Extensive marketing experience and tools to sell your home. No. 1 individual agent, Fort Worth, 2016 & 2017.